DiskPulse Server is especially designed to be as simple as possible. The product does not require any third-party software applications and may be installed and configured within a couple of minutes. A fully functional 30-days trial version of DiskPulse Server may be downloaded from the product downloads page. The installation package is very small, 4MB - 5MB depending on the target operating system, and the product requires just 20MB of the free disk space on the target server. 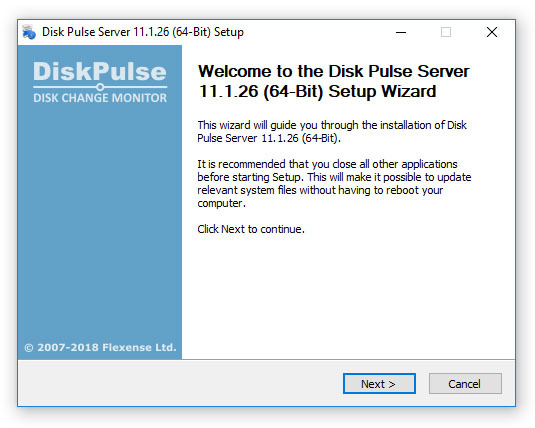 In order to install DiskPulse Server, start the setup program, select a destination directory and press the 'Next' button. Optionally, enter custom server control and/or web access ports. 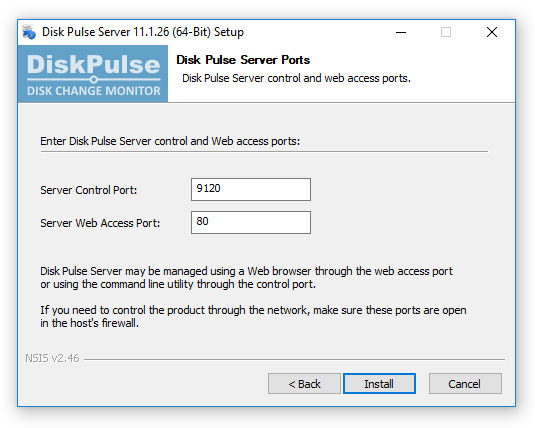 The server control port is used by the DiskPulse client GUI application and the command line utility to connect to DiskPulse Server. The web access port is the port for the web-based management interface allowing one to control DiskPulse Server using a standard web browser from any computer on the network. If DiskPulse Server should be controlled remotely through the network, make sure one or both of these ports are open in the server's firewall. The silent product installation procedure will install the product to the default product installation directory without showing any GUI windows or messages.